ARLINGTON, Va., June 9, 2018 /PRNewswire-USNewswire/ -- Today, the USO joined forces with Flex Events HQ to break the GUINNESS WORLD RECORDS title for the Most people performing a bodybuilding pose simultaneously as part of the #Flex4Forces campaign. You can still participate in #Flex4Forces. Participation is simple - just follow these three steps! A new GUINNESS WORLD RECORDS title-breaking amount of 803 people was made official during 'Flex on the Mall', an annual day-long fitness competition held on the National Mall. The previous GUINNESS WORLD RECORDS title amount of 794 people was set by Rutgers University on September 28, 2017. 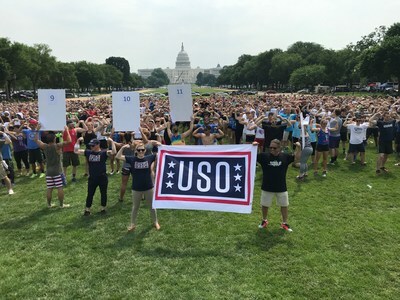 To surpass the previous record, the hundreds of USO supporters and event participants had to all hold a double bicep pose simultaneously for 35 seconds. "At the USO, we believe a strong America is a force for good in the world and our Flex4Forces campaign sends an important message to those who serve and their families – that America cares and appreciates their service," said USO Senior Vice President of Brand Advancement Paul Allvin. "This event and achievement is a great demonstration of Americans being a Force Behind the Forces and truly shows our service members that there is strength in numbers." 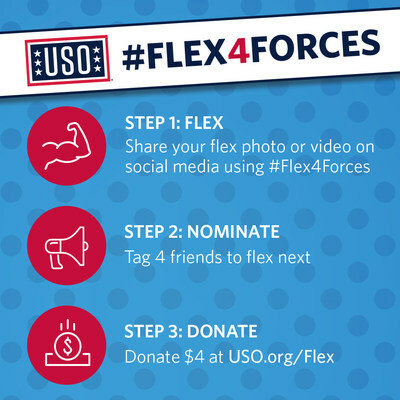 The #Flex4Forces campaign invites Americans to show their support for our nation's service members by flexing their biceps on social media and inviting others to do the same. The campaign—which began May 1 in celebration of National Military Appreciation Month and continues through Independence Day on July 4—builds upon the USO's mission to keep service members connected to family, home and country, and encourages all Americans to rally together as a Force Behind the ForcesSM. Participating is easy and demonstrates appreciation and commitment to our nation's service members and their families. Simply follow the steps below to show you support our nation's heroes and believe a strong America is a force for good in the world. For more information on the USO's #Flex4Forces campaign, please visit USO.org/Flex. The USO strengthens America's military service members by keeping them connected to family, home and country, throughout their service to the nation. At hundreds of locations worldwide, we are united in our commitment to connect our service members and their families through countless acts of caring, comfort, and support. The USO is a private, nonprofit organization, not a government agency. Our programs, services and entertainment tours are made possible by the American people, support of our corporate partners, and the dedication of our volunteers and staff. To join us in this important mission, and to learn more about the USO, please visit uso.org.